For the past two decades, ever since its founding in 1996, Winmate Communication of Taiwan has been specializing in industrial display technologies and solutions. The company has also branched out into Panel PCs, digital signage, marine grade displays and computers and, most recently, rugged Mobile PCs, panels, embedded automation controllers, and rugged and ultra-rugged Tablet PCs such as the 10-inch class and Haswell-powered IH83 reviewed in this article. The underlying platform has been a mature workhorse of a tablet for years that Winmate now significantly updated both in terms as features and performance, as well as exterior design and ergonomics. The IH83 is a member of Winmate's compact, rugged Tablet PC slate family that comes in a variety of configurations. 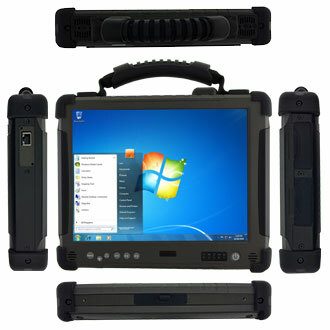 For several years, Winmate has been offering tank-like ultra-rugged tablets with various screen sizes (8.4, 10.4 and 12.1 inches) and various levels of performance (from low end Intel Atom to high end Intel Core). This review covers the R10IH8M-RTT2GP model that comes with a 10.4-inch XGA (1024 x 768 pixel) transflective optically-bonded display with a 4-wire resistive touchscreen and a strong 700-nit backlight (commercial notebooks usually have less than 200 nits). Onboard connectivity consists of three USB 3.0 ports, a legacy RS232 serial port, RJ45 LAN, microphone and headphone jacks, and a docking connector. The machine measures 10.3 x 8.4 inches and it is 1.8 inches thick. That's just the tablet box itself, and not including the handle, or the optionally available (and recommended) rubber corner guards (see in small picture below). The unit weighed 5.3 pounds as tested. Compared to four different Intel Atom and Core 2 Duo based Winmate rugged tablet we tested five years ago, back in 2009, this latest Intel "Haswell" powered test tablet offers much higher performance and lower power consumption. Storage, both RAM and mass storage, have improved drastically as well. The new IH83 comes standard with 4GB of DDR3L 1333 or 1600 memory in a SO-DIMM, upgradeable to 16GB (both figures 8 times higher than the 2009 models). Mass storage no longer relies on relatively problem-prone rotating media at all; Winmate now offers mSATA-based solid state disks with capacities of 64GB to 256GB. Integrated wireless local networks are faster and more flexible, too. It's now 802.11a/b/g/n WiFi and Bluetooth 4.0. The same goes for mobile broadband options. Those are optionally supplied by either 3G or 4G/LTE Sierra Wireless modules. In fact, none of the above truly matter because the Winmate IH83 doesn't pretend to be a sleek media tablet. It's a rough, tough computing tool for the job, one designed to survive drops, rain, heat and cold, and a slew of other challenging environmental conditions. This isn't a fancy SUV or cross-ute for suburbanites; it's a tough truck for folks in the field who need computers, but can't be bothered with babying them. Like Winmate's prior ultra-rugged tablets, the IH83's design is very straightforward. There is no fan, and that always simplifies things. The housing consists of two halves, an ABS plastic top and an aluminum-magnesium bottom, with the heavy bottom piece providing complete rigidity. The plastic top probably saves some weight, which allows this Winmate tablet to be fully-equipped and very rugged, yet still come in at just a bit more than five pounds. The overall design is reminiscent of a class of super-tough, boxy tablet computers that once were fairly prevalent, but now have given way in many places to lighter, thinner designs more in tune with modern consumer tastes. There are, however, still plenty of applications where maximum, no-compromise ruggedness matters, and that's what the IH83 is for. Below you can see the front and all four side views of the Winmate IH83. Note that the protective rubber plugs on the right were left in place for product photography. The left side has its RJ45 jack exposed as that's the way our test machine arrived. And as already stated, the eval also came without the optional protective rubber bumpers. You can see the screw holes where they attach on each corner. Next to that are physical controls for audio volume up and down, and then the three function buttons. The image below shows the right side of the Winmate tablet with the protective rubber doors held open.The thick, soft rubber plugs offer a reasonably good seal, but it's important that they are seated properly, or else they can't reliable keep liquids out. They are unmarked and a bit hard to open, too, and it can be difficult to insert USB connectors and such because the plugs tend to get in the way. The Intel Core i5-4200U processor inside the Winmate IH83 is part of Intel's ultra-low voltage lineup of mobile processors. It is a dual core/quad-thread design based on Intel's 22nm processing technology. The chip has a base frequency of 1.6GHz, but can reach turbo speeds of up to 2.6GHz. Its thermal design power of 15 watts is significantly lower than that of desktop processors (up to 85 watts or so) or even standard voltage mobile chips (usually around 35 watts). 15 watts is still much higher than any Atom processor, even the new "Bay Trail" kind, but that's offset by the Core architecture's much more sophisticated power savings technologies. Also of note is that the Core i5-4200U comes with integrated Intel HD Graphics 4400 with 20 execution units. And between PCIe Gen3 running on the CPU now, SATA III channels, and native USB 3.0 ports, bandwidth bottlenecks are a thing of the past and place the Haswell chip inside this Winmate ultra-rugged tablet miles ahead of its predecessors. So how does all this relate to the power draw and battery life one can expect from the Winmate tablet? As is our standard procedure, we used Passmark Software's BatteryMon power management benchmark utility to measure the IH83's power draw under various operating conditions. With the Windows power options set to "Power Saver" and using the lowest display brightness, we saw an idle power draw of 6.5 watts. With brightness at about 40%, it rose to 8.2 watts, and with the backlight at its highest setting (which is very bright indeed), it was 10.4 watts. With the Windows power options set to "Balanced," the most commonly used setting, and display brightness at its lowest, we saw an idle power draw of 7.5 watts. With brightness at about 40%, it rose to 9.0 watts, and with the backlight at its highest setting it reached 11.4 watts. With the Windows power options set to "High Performance" and using the lowest display brightness, we saw an idle power draw of 8.2 watts. With brightness at about 40%, it rose to 10.7 watts, and with the backlight at its highest setting, it was 13.9 watts. Running full 1080p mp4 video that way maxed out at 15.5 watts. Given the battery's 57.7 watt-hours, minimum draw would yield a theoretical maximum bttery life of 8.9 hours, and maximum observed draw 3.7 hours. This makes Winmate's claimed "up to 7 hours" look reasonable. Winmate, very much a technology company, has given considerable thought to the topic of optimal display viewability under all sorts of lighting conditions. A whole section of their website is dedicated to "Optimized Visibility" where they discuss in great detail optical bonding, sunlight readability, hyper dimming, AR/AG glass, and light sensors. The totally unprocessed picture below shows how rich and strong the Winmate tablet's display can look outdoors. True, this was under optimal conditions (i.e. overcast, no direct sun, no reflections), but it does show how contrasty and bright the display is.